There are many ways to record video, and some of them require special software and equipment to work properly. However, the easiest and most convenient is right at the tip of most everyone's fingertips - your smartphone! Digital camera technology has come a long way in recent years and is now at the point where people can very simply produce high-quality video in a matter of minutes - all with the convenience of your smartphone. If you are already a tech-savvy person that understands how to record a video and send it to us - that's great! Just go ahead, we encourage you. Please send it to us at advertising@advancedaffordablehearing.com. NOTE: Video files are typically too large to send as attachments to regular emails, therefore an application such as Google Drive might be a solution. However, we have presented a simple procedure below so unless you already understand how to use Google Drive and file sharing keep reading below. Need Instructions? Here are some details that will help make this process simple enough for everyone. Please note, that if you would prefer to have someone else (such as a spouse or child) record your testimonial on your behalf and send it in, that would be fine as well. Prepare a few short paragraphs describing your experience with your hearing aid. How have your hearing aids had a positive impact on your life? Tell us about some of the sounds that you enjoy hearing again or haven't been able to hear for a long time. Has better hearing improved your relationships with your spouse, family or friends? What about your attitude, social activity and general outlook on life? Has it improved or gotten better? Are there any new success stories in regards to your job or lifestyle? Your personal comparison of value between our low cost, affordable hearing aids vs. high-priced, expensive hearing aids. Find a well lit area in your kitchen, living room or other comfortable location to record your video. Have a spouse or friend hold the smartphone for you (or for someone on behalf of you). Speak clearly into the camera to produce good sound quality. When complete, replay the video to make sure the sound is clear. Make sure the video isn't shaky. Make sure you are comfortable with others viewing your recorded video. 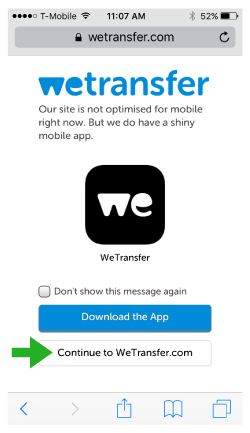 Open the internet browser on your phone and navigate to www.wetransfer.com. 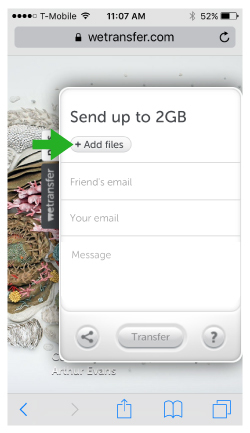 Wait for the page to load and then click on Continue To WeTransfer.com. 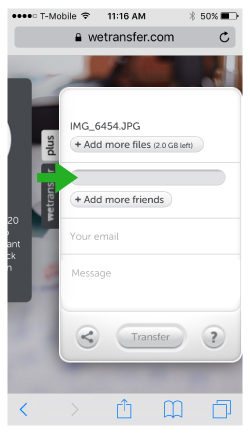 Click the +Add Files button. Next, you will need to find the file on your phone. NOTE: Each phone is different, so you may need to search the documents, photos or videos folder or your camera. The location where recorded video files are stored will be specific to your phone. Click on "Friend's email" to add our email address OR just enter advertising@advancedaffordablehearing.com into the box provided. Be sure that your email address is entered into the Your Email field. 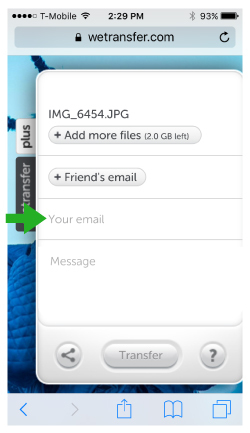 You can do this by tapping the words Your Email or the empty box if that appears instead. This will tell us WHO the video is from. 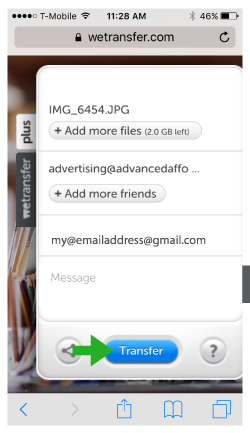 Optional -You can add an optional message if you like in the "Message" section. Otherwise, you should be ready to send the file. 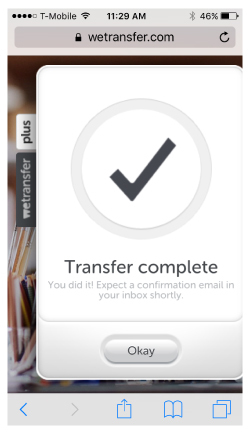 When ready, click the TRANSFER button to begin the send process. NOTE: Video files are sometimes relatively large and may take 10-15 minutes to upload and send depending on your Wifi or Internet connection. 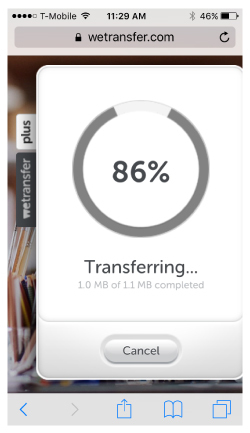 The wetransfer website provides a visual indicator that allows you to easily monitor the progress of your file transfer. Once we receive the file, we will contact you to say thanks and let you know that everything was received. We will also ask for you to provide your consent (usually via email) to share your video on our website and social media, such as YouTube or Facebook. Please note that full names will NOT be used for identification purposes. Here are some of our most recent video testimonials customers have shared!